Does not produce amino acids, vitamin C, or carbs. Is a non-living chemical (iron). Is expensive, and must continue to be replaced. Needs some place to go (bag, reactor, etc). If spilled into water is very hard to remove. Can lower phosphate too low, resulting in coral bleaching. Have been reports of GFO causing HLLE disase in fish. Capacity is reduce from first day, and continues dropping. Does not provide any useful end product. Heavy iron particles can clog your drain. The iron can fuel nuisance algae growth. Produces amino acids, vitamin C, and carbs. Is free, and replaces itself. Needs some place to go. If spilled into water is easy to remove. Cannot lower phosphate too low. No reports of causing HLLE disase in fish. Capacity increases from first day, as growth develops. 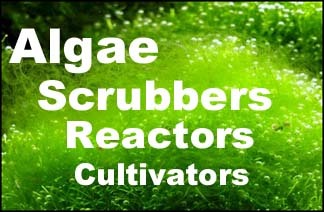 Provides useful end product (algae). Very light particles go down drain easily, and dissolve. Needs light/electricity (pennies per month).